politicalbetting.com » Blog Archive » So what does this do to the seat calculations? « Time to be taking your profits on the “Labour surge”? So what does this do to the seat calculations? Is it really so different in the marginals? 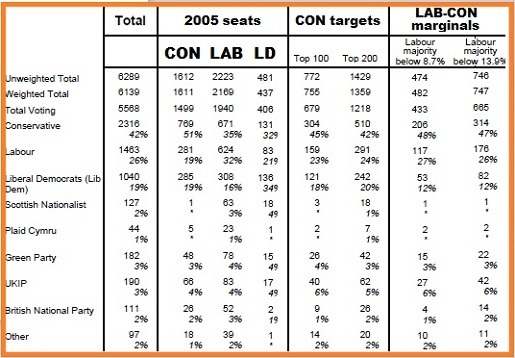 I’m just catching up with the Ipsos-MORI aggregate data for all its 2009 polls which have been highlighted by Anthony Wells at UKPR who is suggesting it provides further evidence that opinion is moving differently in the LAB>CON marginals. For what MORI has done is not only to show the aggregate data but to identify the shares by seat category with a particular emphasis on the marginals – something that is only possible because the aggregated data provides meaningful sized segments. The main caveats are that the information is old, some of it going back thirteen months, and the sheer scale of what is suggested. So what do we make of apparent swing of up to 14% in LAB>CON marginals where the majority is below 13.9%? This is far bigger than anything we’ve seen in the specific polls of marginals from YouGov and ICM and suggests a whole new clutch of seats that could Labour could lose to the Tories. To get to these numbers in this segment then the Tories need to be doing much worse elsewhere – and from the table we get the answer – swings of just 5% in constituencies that the party currently holds. A low swing here, of course, doesn’t matter. So I’m taking the data as further evidence that Cameron’s party is doing better in the marginals but not putting too much store on the scale of the differential. Whatever it certainly underlines my decision earlier in the day to close down Labour buy and Tory sell spread positions.